Home » IDSecurityOnline Blog » Visitor Management » What Are Visitor Badges and Why are they Essential? What Are Visitor Badges and Why are they Essential? Visitor badges are commonly issued by businesses and institutions (e.g., educational, governmental) to easily identify visitors and control and monitor access to areas/systems not open to the public. All visitors should be issued a visitor badge. They are used as temporary identification for visitors, vendors, temporary employees, trainees, and contractors. In some organizations (especially with high levels of security), all visitors must always wear badges in all areas. Visitor�s first and last name. Visitor�s status or designation (e.g., visitor, client, contractor, interviewee, service tech, etc.). Date and time of check in. A QR code for fast check-in and check-out. Value to Visitors � Any visitor appreciates receiving their visitor badge efficiently (automatically, without delay) on entry; they also value having a recognized credential while on unfamiliar premises (it renders their experience safer and more convenient�because they�re recognizable as visitors). Issuing ID badges to visitors is also an opportunity to formally welcome every visitor. With an established visitor check-in system, organizations ensure every guest is properly welcomed into your building, documented and checked-in�which increases the organization�s ability to help/assist them. A visitor�s hosts are grateful to quickly recognize their visitor on arrival, and an organization�s personnel are all more effective when they can easily recognize who�s in the building and what�s their purpose on the premises. It�s easier to offer help when personnel know why someone they don�t recognize is there. Any organization knows it�s easy for strangers to bypass reception unnoticed. However, when it�s established policy for visitors to be issued ID badges on entry, visitors not wearing a badge are easily spotted by security staff or other workers. Issuing badges to guests is an effective security tool to keep an organization�s restricted areas (and people, data, and assets) safe and under control, while fostering a well-organized work environment. With visitor badges unique to the company, guests can only get them from the front desk, so guests wearing generic visitor badges or no badge at all clearly need attention. It�s always an enhancement of safety, security, and control when an organization�s personnel can walk the organization�s halls and easily �get� even the people they don�t recognize. Whether a production facility, a school or a hospital, welcoming visitors is necessary for many reasons in all work environments. Visitor ID badges keep organizations safe. A properly implemented visitor ID badge system, made part of reception protocol automatically deters potential threats, and creates a record of who is on campus and when. Readily identify visitors as legitimate or a potential threat. Verify visitors� identity and purpose/authority for being in a particular area. Quick Recognition is Key � Regardless of content, visitor badges should be visually distinguishable from other ID cards issued by the organization to its own personnel, so everyone knows who�s a visitor and who�s not. Moreover, creating different badge designs for different visitor types/purposes helps organization regulars readily distinguish who is visiting for what reasons. As simple as this is, this quick ability to know why someone not otherwise recognizable is on site strengthens an organization�s overall security posture. The key to visitor-badge utility is enabling quick, at-a-glance recognition of validity. 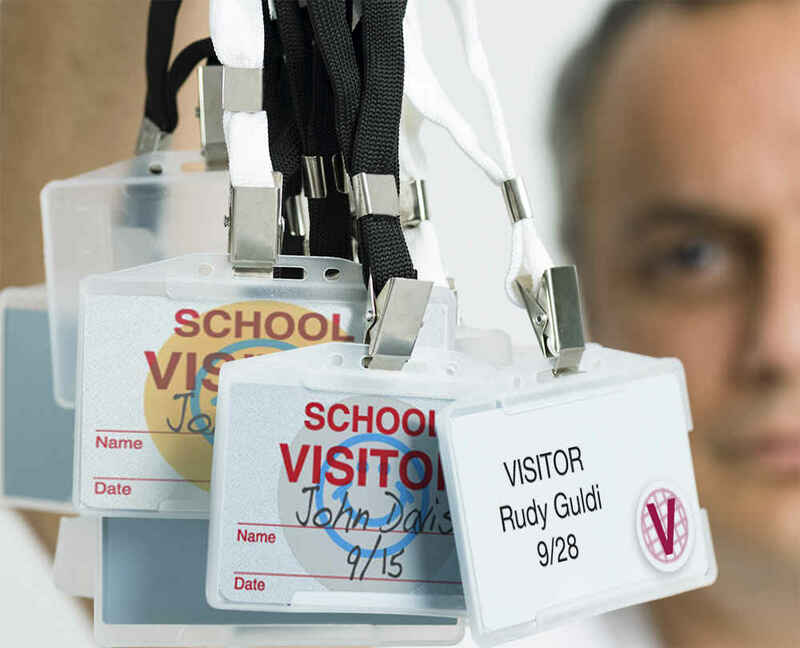 Properly used and configured, visitor badges are an effective security tool that allow authorized visitors intended access while preventing unwanted visitors from unauthorized access to secure areas. Revealing Badge Expiration � Visitor badges are commonly issued on a �temporary� basis for defined periods, purposes, and areas�the permission they grant is temporary and of limited duration. Sometimes visitor badges are issued for recurring visits over a defined time. Either way, their validity typically expires at some point. Because they�re temporary, card issuers need to ensure that visitor badges are not used after expiration. To accommodate this need, visitor badges have evolved to feature �self-expiring� technology. Self-expiring visitor badges are simple, effective, and affordable. They�re a great way to ensure the issuer knows any visitor�s status�quickly and easily, even at a distant glance. These badges automatically expire after a certain number of hours, days, or weeks�preventing the badge from being reused on another day. This easy-to-use badge technology does this by transforming some visual aspect of the card when it expires. That is, it causes the badge color to change or adds markings (revealing a striped pattern or spot indicator) after a prescribed amount of time thus letting everyone know it�s expired, revealing its invalidity and preventing it from being used again after its color has changed. After 24 hours (or whatever interval the thermal paper is configured for), a large, red �void� mark appears on the badge. This is possible because of slow release of red ink from the badge, which has multiple layers. The color change helps issuers prevent unauthorized use or re-use of visitor badges. TEMPbadge Self-Expiring Badges can expire immediately (LIGHTbadges exposed to ultra-violet rays) or over a half-day (4 hours), full day (18 hours), one week (7 days), or one month (30 days). The issuer chooses the expiration time that works for a particular application/circumstance�half-day, one-day, one-week, or one-month. TEMPbadge originated the patented Visually Changing Paper (VCP) technology. This technology uses coating and printing capabilities to create materials that reveal a message, color or design after a specified time. A chemical reaction causes badge appearance to visibly alter either through color change (e.g. white to blue) or by the appearance of slanted red lines. The changed color indicates the badge is "VOID." Non-expiring visitor badges are a simple, straightforward way to ensure visitors are properly identified while on company premises. Apply thermally printed adhesive ID labels to reusable PVC badge backs, or print directly on thermal-printable clip-on tags. Simply print visitors� names, authorized use date(s) and times�and any other pertinent information�and issue to visitors. These are just a few of the many benefits of using visitor ID badges to improve your work environment. Hundreds of products including self-expiring badges, security seals, parking permits and wristbands designed for visitor control in financial, commercial, governmental and educational facilities and meeting/convention sites are available to ensure any organization�s prudent visitor policy is effectively, consistently, and affordably implemented. Blank adhesive labels�for thermal-printed or handwritten tags�in a variety of colors.